It is a lamentable fact that the necessity to keep things- in this case movies- is a relatively new concept, and certainly one which has not involved all parties for all of the time. True, archives like the Cinematheque Francaise (under the auspices of Henri Langlois) have been around for many years, but even they have fallen victim to others holding opposing views (in this case the occupying German authorities). Of the major studios, the realisation that they are curators of not just potential DVD releases but a national- and international- heritage is a far more recent phenomenon. Indeed, Caroline Frick opens her book Saving Cinema- The Politics of Preservation with an account of the 1990 Universal Studios fire, highlighting as it does the attitude to loss, and potential loss. It is highly ironic that the book should begin with a fire, for the aftermath of such an inferno is exactly what reading the contents becomes. In short, one can see where one is supposed to be looking (and has a hazy idea of what at), but the surrounding mist/ smoke makes visualisation difficult. Frick’s book is divided into six chapters, including such approachable titles as ‘International Discourse and Global Film Heritage: Defending the National’, and is the literary equivalent of wading through treacle- there is barely a sense of progress, and what progress there is remains slow. One of the key problems is that the arguments made are virtually always made without specific film examples to underpin what is being said. For example, that Warner Brothers ‘effectively utilized its older titles prior to the advent of television, if primarily for marketing purposes, public relations and nostalgia tributes’ (p. 67) is fair enough, but not to mention any particular films in this paragraph lessens the impact and makes the text dry and undynamic. Another problem with Frick’s book is the hugely unnecessary use of acronyms. Between two pages (pp. 95-96), for instance, we are introduced to UNESCO, ICIC, IECI, the BFI and CAME. True, UNESCO and the BFI should not be unfamiliar, but this is indicative of the desire to continually namecheck organisations- the result being, again, a clouding of the overall picture. Despite these foibles, Saving Cinema does make some valid points, not least about the potential advantages of modern society in two key respects. Firstly, the ability to make lossless copies of material is a decided plus- the risk of a specific title being lost becoming increasingly minimised. Secondly, the democratisation of the Internet means that access is, theoretically, less restricted than before- ‘in the digital age, perhaps widespread, bountiful access is, itself, preservation’ (p. 153). Overall, Saving Cinema- The Politics of Preservation is a worthy (but dull) attempt to provide an account of conservation and preservation methods. The areas the book invites the reader to discover are largely necessary ones, but its density acts as a hefty barrier to doing so. 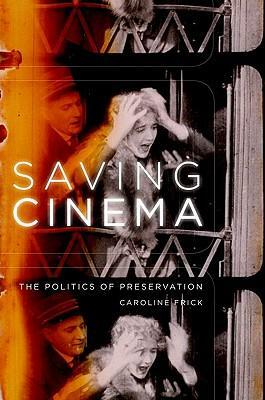 'Saving Cinema- The Politcs of Preservation' is published by Oxford University Press.